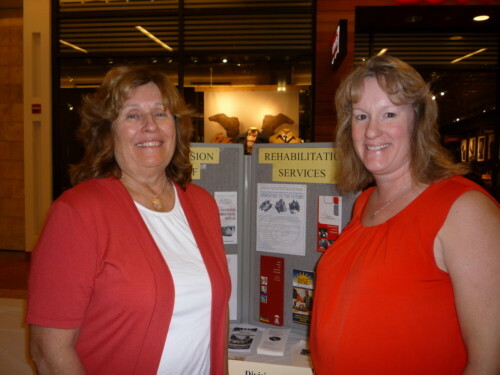 Yvonne Kranitz, left, regional director, Division of Rehabilitation Services, of Annapolis, and Julie Roher, counselor in the DORS Division of Blind and Visual Services, of Bowie. The Anne Arundel County Commission on Disability Issues and County Executive John R. Leopold presented awards to individuals and businesses for their support of people with disabilities during the 2012 disAbility Awareness Day on Oct. 27 at Westfield Annapolis Mall. The Commission recognized special needs architect Catherine Purple Cherry with the top honor, the 2012 DAD Award. Mary “Mimi” Stoops, program manager, student support services, Anne Arundel Community College, received the Disability Leadership Award. The public also visited with the 35 exhibitors who provide services to individuals with disabilities. For information on the Commission, contact the Americans with Disabilities Act office at the Anne Arundel County Department of Aging and Disabilities at 410-222-4464.